I know, I know, everybody else read this when the English translation came out in 2012. 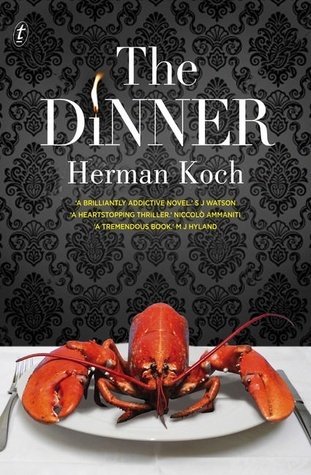 Herman Koch’s The Dinner was an international bestseller and it won a prize in the Netherlands too. The ‘dinner’ is a vehicle for two brothers and their wives to meet up at a restaurant, and the book parts are named ‘Appetiser’, ‘’Main Course’, ‘Dessert’ and ‘Digestive’, with short chapters breaking up the text in each part. It doesn’t take long for an alert reader to decide not to trust the narrator Paul Lohman, because, apart from his supercilious commentary about pretentious restaurants, his brother Serge, his brother’s wife Babette, their children and almost everyone he comes into contact with, he betrays a monstrous ego almost right from the start. An ego not concealed by what looks like an inferiority complex about his more successful brother, who’s a likely candidate for high political office. Paul also has an unnerving habit of presuming that his wife Claire understands and agrees with everything he says and does. Some reviewers have objected to the lack of credibility in the ending, but IMO it’s intentionally lame. The narrator has established himself as self-deluded, and I think that he is self-deluded about the inevitable consequences of what occurs. Anyone reading it will close the book thinking, ‘but what about…. ?’ ‘surely, such-and-such would happen’ and so on. Well, yes, but think how lame the book would have been if the author had written his final chapters with such an entirely predictable resolution, one which any reader could foretell. Much better to leave threads dangling in the air, with Paul thinking he has been so clever and readers arguing about whether he has succeeded or not. One small detail impressed me. This author has used the ubiquitous mobile phone and other social media to great effect. I wasn’t so impressed by the satirical commentary on modern dining. It’s been done before, and it’s like satirising the fashion industry or the male fetish for the motor car – unless there’s some purpose to it (such as exposing the selfishness of the West) there’s no point in doing it. But the amoral parenting of teenagers, and the extent to which parents who want to be friends with their children ultimately betray them, makes for an interesting theme, even if the plot lacks credibility here and there. Kim at Reading Matters reviewed it too. I enjoyed The Diner and I really liked the structure and metaphorical humor of the menu. You’re probably right it probably isn’t “important” but I thought it was rather clever and quite funny. It’s not that I don’t think it’s important, it’s just that all the author does is raise the issue, not really explore it in any depth. Actually there’s a lot of issues (mental health, media scrutiny, social media etc) but they all get raised but not teased out much. But in this type of book, I don’t think it’s expected, in fact it would probably spoil the pace of the book. And you’re right, it is funny in a creepy sort of way. I did a little “study” of it for my blog – I got really fascinated by how the choices of the individual characters suited them. I go on for each course, each character – I had a wonderful time – lol! What fun, what’s your URL for this? I wasn’t all that impressed by the novel as a whole – it was good but … the menu really did interest me. I really enjoyed this one a lot. I’m hoping more by this author is translated. I listened to a podcast with an interview with the author which really brought out another layer to the novel for me. It was also very interesting to hear the different opinions of members in the recording audience (it was BBC I believe) because there was such a wide variety of responses to the questions raised about parenting teenagers! Nope, I didn’t so you’ve beaten me, which isn’t a surprise given your rate of reading. I’ll read this review one day when I read the book … Did I say WHEN? I think I mean IF! But I’d like to. I’m curious … what made you buy it? Did we both succumb to hype? Oh no I haven’t bought it yet Lisa – it’s one of the virtual TBR books not the actual physical one!